Despite the availability of online solutions, companies still face challenges related to managing their safety data sheets with traditional paper binders. There are many reasons for a company to be hesitant to implement an online solution, much of the time those hesitations are cost related. However, the lack of a centralized system will cost companies tremendous amounts of money spent in labor, materials and printing costs associated with managing SDS records within paper binders. In addition, when you add up all of the related costs to managing SDS(s) with paper binders, it’s more expensive than purchasing an online solution. KHA’s staff continually monitors SDS records within your system and updates SDS records as they become available. Updated SDS are added to the binder(s) in your Online-SDS system automatically. Outdated SDS are archived within your system and are available on demand. As you can see, the online system allows a streamlined approach to managing your safety data sheets which save your company time and money in related costs. Using KHA’s Online-SDS system allows skilled workers to focus on the tasks that move your business forward. Our online system updates SDS(s) throughout your organization automatically so your facilities are always in compliance. Updates to SDS are applied to your entire system, so all binders containing a specific SDS are updated. 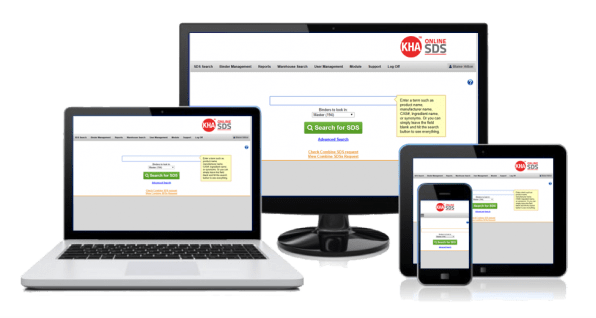 One of the benefits of an Online-SDS system is the fact that KHA can accommodate requirements and SDS organizational structures specific to your facility. Businesses who review product information regularly for safety reasons also have better workflow when they can access all SDS from one location. While other online solutions may charge fees based on the number of SDS per location, KHA indexes your entire inventory of chemicals used throughout your facility and only charge for the number of unique SDSs. In addition, you have the ability to archive SDS records for unused chemicals within your Online-SDS system. This allows you to still access the information in the SDS, but removes the charge for the SDS from your bill. If the material(s) come back into use within your facility, the SDS record can be restored to active status within your account. You are safeguarded from Internet failure or power loss. KHA’s Load-N-Go export backup feature allows you to store all of your SDS for emergency access offline. Offline SDS can be stored on any external drive, flash drive, laptop, CD, etc. We do not restrict the number of users on your account, unless specifically asked by the client to do so. We then tailor accessibility, for each user, to the needs of your facility. There are many different permissions levels that can be supported which gives your company great flexibility when tailoring accessibility for each user on your system. For our many clients who have non-English speaking employees, we provide the ability to set up their Online-SDS system in multiple languages. There should be no barriers keeping employees from being safe. However, SDSs will be published in the language they are written in, as they are created by the material manufacturers, not KHA. Printing labels for regulated substances’ containers should not be a time-consuming task for our clients who need to transfer chemicals from one vessel to another. Printing secondary GHS labels is easy with our Online-SDS system and helps keep our clients in compliance with OSHA. Printing labels is available for all SDS within your system and are available to be printed in not only GHS format, but also NFP, HMIS and US DOT. Compliance reports are a necessary part of maintaining a chemical inventory. Many facilities must submit reports throughout each year to local, state and federal officials to comply with regulations for operating facilities that handle dangerous chemicals. Our Online-SDS system is accepted by OSHA as a viable method to maintain SDS systems. Our clients can more readily track and test their compliance status, and avoid potential violations, fines and headaches! While it may seem easiest to stick with using traditional methods of managing your sds records, Online-SDS management offers a lot of bang for your buck. As you read above, there are advantages to using Online-SDS that go beyond just cost savings. When you are ready to streamline your management of safety data sheets, contact KHA for a free demo.